The past week and a half have been chaotic in Boston, with somber moments. But I'm an eternal optimist, and I can never focus on the negative. Good things happened last week as well. Mostly it was about coming together with friends who share the joy of building things. The Live Free Or Die Antique Tool Auction was Friday and Saturday in Nashua, NH. I stopped by to pick up some items for Jim Parker, one of my students after taking one of my classes at the New England Home Show, and I was looking for a small rip panel saw to match my small crosscut. While this is always a fun event, like being a kid in a candy store, what made it really fun was running into people I've met through woodworking. First I ran into my favorite Internet tool dealer, Patrick Leach. Then Stewart, a fellow member of the Guild Of New Hampshire Woodworkers. Then I saw Herv Peairs and his wife Margy. You may recall they also took my classes at the New England Home Show. Herv had printed out my tool list and was making his way around the dealers at the tailgate sale in the parking lot. I helped him pick out some good deals. I meant to get a picture of him grinning with his new acquisitions, but forgot to. Then I saw Dwight, one of my private class students from last summer, followed by Roger Meyers, another GNHW and SAPFM member. It was a regular party! To cap it off, I found exactly the saw to match the one I had. I've been wanting to put together a shorter portable toolbox that wasn't quite so awkward to carry around as my current one. The saw I already had is an excellent 18" Disston 10 PPI crosscut that I believe is from the late 1800's. The etch is almost illegible, but it clearly has "Disston" centered over the keystone, along with the "Warranted Superior" eagle medallion. The new one is an 18" 8 PPI crosscut that I'll re-file to rip. The marking on it is just barely legible stamped "Browne 3 Warranted cast steel"; there's no medallion. I found one reference from Pete Taran that says Brown's (mine is clearly BROWNE) was acquired by Disston in the 1860 time frame. As you can see, the handle is virtually identical to the somewhat worn Disston. Disston top, Browne bottom. The handles are almost perfectly identical from all angles except for the wear on the Disston. Woodworking is truly a universal endeavor, but sometimes the world is amazingly small. I've known Federico Mena-Quintero for a couple years now on the Sawmill Creek Neanderthal Haven forum. He lives in Veracruz, Mexico. After I got my new job at Akamai Technologies in Cambridge, he sent me an email telling me he had worked in that very building back before Akamai occupied all the floors! He's one of the cofounders of the GNOME project (if you use Linux, you may be familiar with GNOME and GTK). Federico was in Cambridge last week for an annual GNOME hackfest held at the One Laptop Per Child office, though it was partially disrupted when Boston was locked down Friday. We met for lunch on Monday and talked about woodworking and programming. 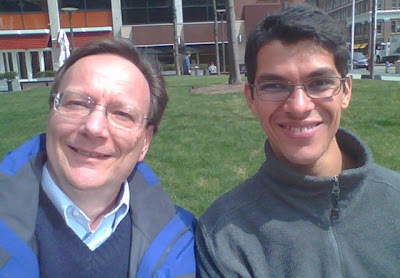 Federico and I enjoy the sun in Cambridge. Speaking of Akamai, Atin, one of my former colleagues from Redstone/Unisphere/Juniper Networks started there Monday. We worked together on the ERX router; if you go online almost anywhere in the world, you're probably tickling our code. Such a small world! Finally, what better celebration of life than a new puppy? 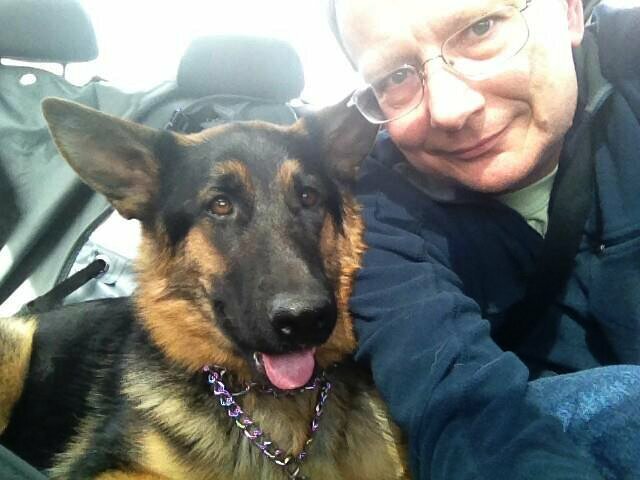 Sadly, we had to put our 10-year-old German Shepherd Dog, Trudy, down the day after Christmas due to cancer. That was like losing a family member. 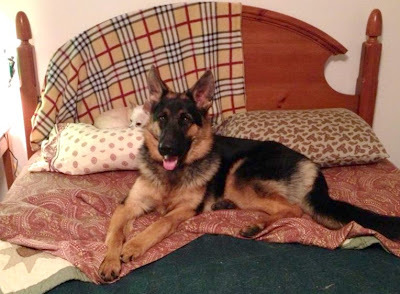 This weekend we picked up a partially trained puppy from the same breeder. She's not quite 9 months old, just the sweetest thing! I do appreciate being past the really high-maintenance young puppy stage and it's sleep-interrupted nights. Gypsy in the car on the way home. She's ready for bed. That's our chihuahua on the pillow. Note how we've artfully mixed the bed linens. Sounds like fun. I would love to make it to a Live Free Auction one of these times. It's always great to connect face to face with people you interact so much with by ones and zeros. Ps. Nice linen pattern combinations! Oh man, I totally forgot about the Tool Auction, I told myself I wouldn't miss it this time. Thanks for the post, I already have the next auction saved in my phone, iPad, computer, and I may have to get it tattooed inside my eyelids so I don't forget again.